DL180 G6 Smart Array P410i - 3TB drived fitted, ORCA shows as 801.6GB?? This is my first time trying to configure a Raid array. This is my first time with an HP server. I'm using 3x 3TB WD Red drives, and aim to have them as a single Raid 5 array without live spare. The drives are not formatted yet, straight out of the packet and into the caddies. I entered the ROM configuration utility, but they are presented as being 801.6GB, not 3TB. The attached photo shows the issue. Do I need to update the ROM firmware? If so, how? (I need an idiot's guide). Re: DL180 G6 Smart Array P410i - 3TB drived fitted, ORCA shows as 801.6GB?? Since you are using non-HPE hard drives (WD Red Hard drive), not sure if the issue is being caused becuase of compatibility. 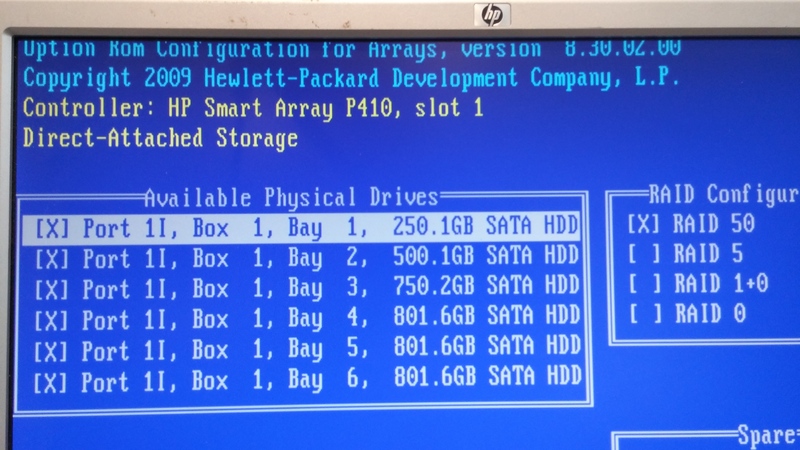 You can put in a HPE hard drive in that slot and check if the correct hard drive size is being detected. If so, it could be a comaptibility issue. The latest firmware for P410 is 6.64 (B). In case you want to update it to the latest version with no OS installed on the server, you can use the SPP (Link provided below). Its a bootable iso image that you can boot off and use to update the firmware. If OS is installed, you can download the respective firmware (OS dependent) and update it.